The Rock Solid team designs, installs, and maintains your underground irrigation system for your home or commercial property. Weeds thrive in a lawn’s dry areas. Achieving a weed-free, flourishing lawn, however, is easier said than done, if you’re on your own. It takes a lot of time and devotion to set up a regular watering schedule, position a variety of sprinklers, and comply with community water regulations. Not to mention understanding your property’s unique soil composition and your area’s microclimate. A well-designed irrigation system from Rock Solid can solve these problems. In no time, you’ll have a healthy, beautiful lawn that increases your property value and elevates the look of your neighborhood. At the same time, you’ll conserve one of our most precious resources and realize substantial savings on your water bill! Start to finish, you’re working with Rock Solid owners, certified sprinkler installers, and experienced crews—to guarantee results. We work on private residences, investment property, or commercial property; compact city lots or expansive exurbs acreage. 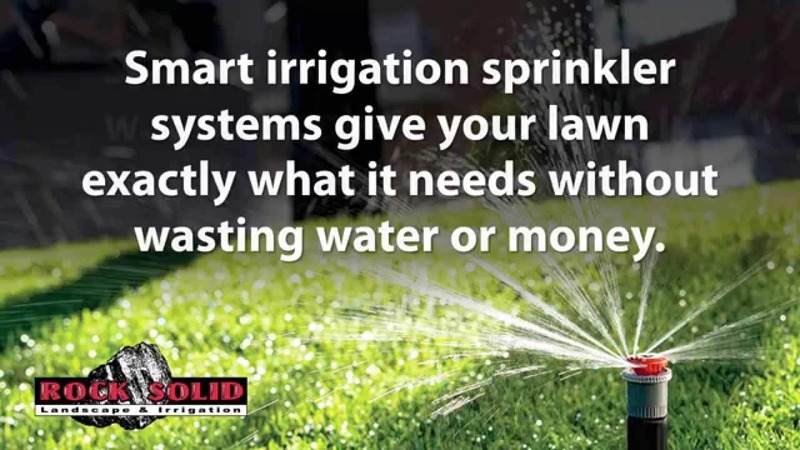 Click to see how a Smart Sprinkler Irrigation System is better for your yard and the planet. Give your lawn 2 weeks to thrive and you won’t be able to tell we were there! Add Rock Solid’s lawn care service and you’ll be looking for new ways to spend the free time you’ll have!